I have never caramelized leeks before and wanted to give it a try. 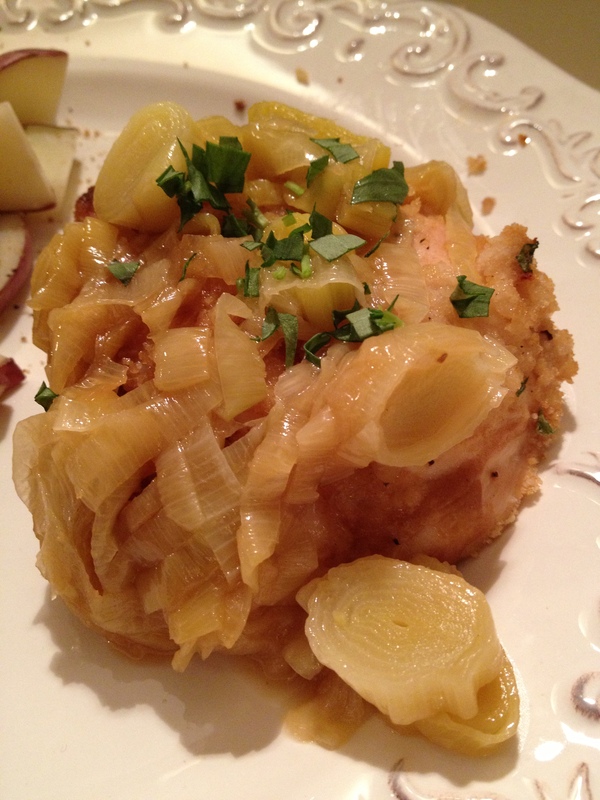 So, I came up with this chicken recipe where the leeks could really shine. It was a very easy dish to make on a weeknight and I will definitely be making it again! After washing and slicing the leeks into rounds, put them into a large sauté pan. Over high heat, sauté the leeks for about 3 minutes, just until they start to wilt. Add the chicken broth, sugar, and pinch of salt. Cover and reduce heat to low. Cook for about 25-30 minutes. In a large bowl, combine the gluten free breadcrumbs and fresh tarragon. Press each side of the chicken breasts into the breadcrumb mixture and then place each breaded chicken breast in a large oven safe sauté pan. On medium heat, crisp the outside of the chicken, about 3-4 minutes each side. Then put the entire sauté pan with the chicken in the oven at 375 degrees for about 25-30 minutes, until chicken is cooked through. Serve chicken hot with caramelized leeks on top.